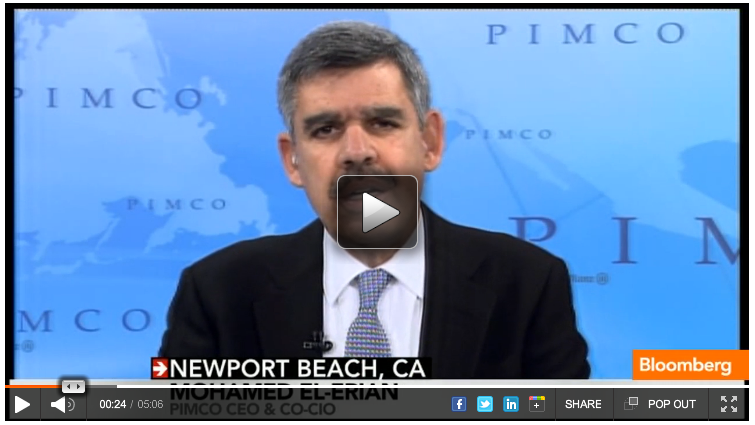 PIMCO’s Mohamed El-Erian says that the U.S. economy is having trouble gaining traction, as evidenced by the latest GDP report. El-Erian tells Bloomberg that in addition to the headline growth number being lower expected, the drivers behind that growth were cause for concern. Consumer spending increased, he noted, but the personal savings rate declined, and that trend isn’t sustainable. He says that business investment is needed to drive the economy, and that wasn’t strong in the first quarter. There’s a “tug-of-war” going on between strong companies that are doing well, and macroeconomic headwinds, he says, and that is causing the lack of business spending. He also talks about the types of stocks he thinks are attractive right now.